With the last day to file your taxes just two weeks away, it’s time for many of us procrastinators to start getting this financial chore out of the way. There are plenty of tax services out there, and you can always file yourself (for free) with pen and paper. I’ll leave that process to you and your ingenuity. Right now, we’re talking about how to pay the lowest taxes possible on your investments this year with help from the E*TRADE Education Center (available to anyone with no sign up) and the E*TRADE Tax Center (for E*TRADE customers). For anyone who has tried to take on complex tax filing on their own, you know a familiar feeling: am I doing this right? As our financial lives get more complex, so does the filing of taxes. Our tax code is extremely complicated, and it’s really easy to let savings opportunities slip through the cracks. But part of being a great investor is maximizing every single return. It’s easy to pay more than you have to, simply because you don’t want to risk an audit. Don’t let this worry cause you to pay too much and lose out on hard-won investment yields. 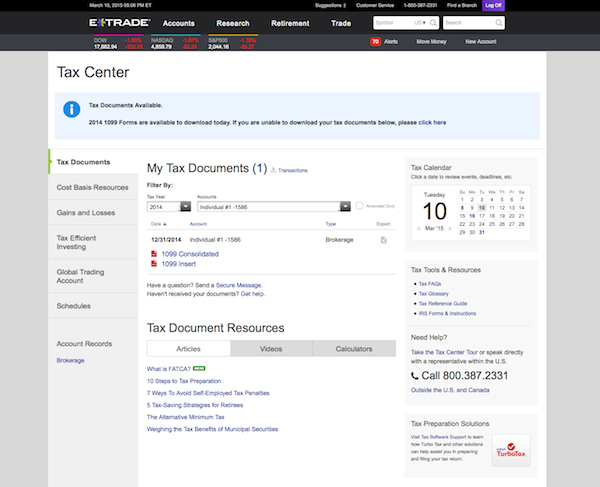 If you’re an E*TRADE customer, their Tax Center can set your mind at ease in a lot of ways. The E*TRADE Tax Center can put you in touch with real tax professionals, available by chat, to help you with the nitty gritty of the tax prep process. The Tax Center also makes sure that your trading history from the past tax year syncs seamlessly with TurboTax if you used that software in the past. You’ve probably got a lot of transactions, gains, and losses to account for from 2014. With E*TRADE , everything falls easily into place, with lots of help along the way if you need it. I greatly prefer this way of doing things compared to going to a brick and mortar tax center. For one thing, you’ll pay a lot more, especially if your tax filing is remotely complicated. For another thing, online tax prep is simply way more convenient. With reliable advice at your disposal from real tax professionals, the E*TRADE Tax Center really is the best of both worlds. 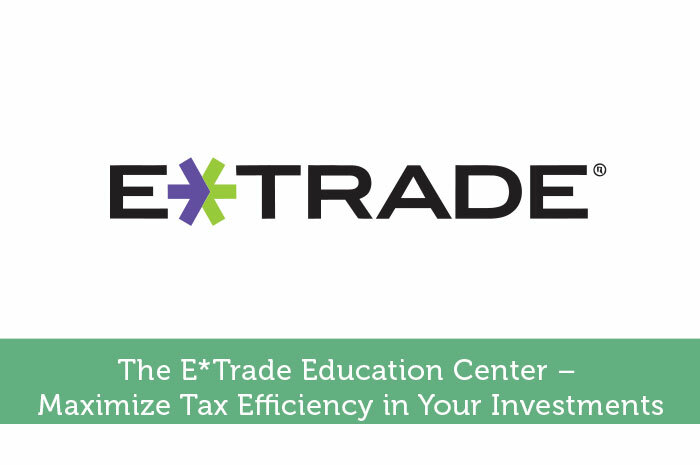 If you have a few days before you need to file your taxes, take advantage of some of the webinars and digestible articles available in the E*TRADE Education Center. 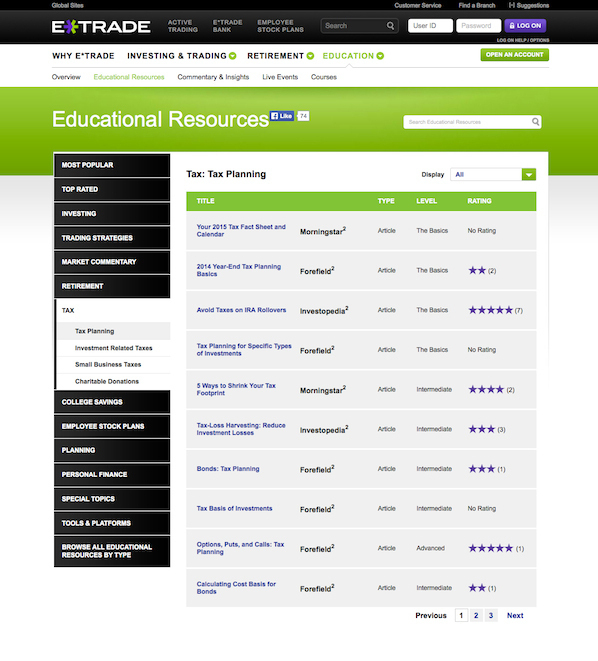 The articles are free and easily accessible to all investors – you don’t even need a log in. All of these reasons are just more things that make E*TRADE one of the best online trading brokers. What’s good trading if you give it all away come tax time? E*TRADE can help you make the most of your investments, simply by keeping as much as possible during the tax filing process. I had no idea that E-Trade offer these services. I know where have I been right? I thought it was strictly for investing so this was insightful. Thanks for the information. Oh, and I do use Turbotax..
As a former IRS agent, my husband is acutely aware of the tax consequences of our investments. If we want to sell a loser, we try to sell it out of our non-retirement account so we can take the loss on taxes. If we want to sell a winner, we try to do it in the retirement account so we don’t have to report the gain. Of course it doesn’t always work that way 😉 Taxes are getting so complicated, sometimes it is difficult even for Hubby. He does use TurboTax as well.